Based on a survey of 121 hospital personnel who serve on value analysis committees (VACs), the study provides in-depth analysis of current decision-making goals, processes, and organizational approaches. It also identifies the top challenges VACs face, and how committees are evolving to meet these challenges. Study findings highlight key takeaways and actions for supplier sales and marketing teams. Each report chapter contains a summary of considerations for supplier go-to-market strategies. 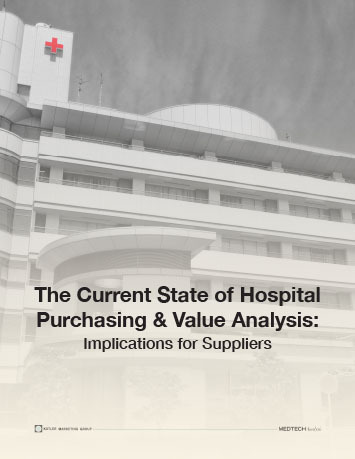 Findings are broken down by hospital size, purchasing orientation, and respondent job role. Copyright © 2001-2019 Kotler Marketing Group, Inc. All rights Reserved.